Kobe. Laid down at Kawasaki's Yard as Submarine No. 10. Cdr (Rear Admiral, posthumously) Kayabara Yasuchika (49)(former CO of I-72) is appointed the Chief Equipping Officer (CEO). Completed and attached to Sasebo Naval District. Assigned to SubRon 2 at Sixth Fleet (Submarines). Cdr Kayabara Yasuchika is the Commanding Officer. I-10 is the flagship of SubRon 2. Vice Admiral Shimizu Mitsumi (former CO of ISE), CINC, Sixth Fleet (Submarines) convenes a meeting of his commanders aboard flagship light cruiser KATORI. Captain (later Rear Admiral) Mito Hisashi, Chief of Staff, Sixth Fleet briefs the assembled commanders on the planned attack on Pearl Harbor. I-10 and I-26 are assigned to the Sixth Fleet's Reconnaissance Unit under Cdr Kayabara. I-10 is assigned to reconnoiter areas in the Fiji, Samoa and Tutuila in the South Pacific and I-26 is assigned to the Aleutians area. I-10 departs Yokosuka for the South Pacific on her first war patrol, carrying a Watanabe E9W1 "Slim" floatplane. Arrives at Kwajalein to refuel, then proceeds to Fiji area. Pago Pago. I-10 conducts a submerged reconnaissance of the harbor. Cdr Kayabara sights a ship that he identifies as an American ASTORIA-class cruiser. I-10 arrives within 1,300 miles S of Oahu. I-10 battle-surfaces and fires twenty shells at the ship, one of which demolishes the starboard lifeboat still suspended from the davits, killing its crew. Two hours later, DONERAIL sinks at 08N, 152W. Of 43 sailors and passengers, only 8 reach Tarawa, Gilberts 38 days later. I-10 is reassigned to Advance Force. On that same day, she is ordered to proceed to the West Coast of the United States to attack shipping. I-10 is assigned to patrol off San Diego, California. I-10 is directly attached to the Sixth Fleet HQ. Departs Yokosuka to chase the carriers of Vice Admiral Wilson Brown, Jr.'s Task Force 11. I-10 is the flagship of Captain (later Rear Admiral) Ishizaki Noboru's SubRon 8, in the "KO" (A) Detachment with I-16, I-18, I-20, I-30 and their support ships, the auxiliary cruisers/supply ships AIKOKU and HOKOKU MARUs. Hashirajima, Hiroshima Bay. Vice Admiral Komatsu, Captain Ishizaki, their staffs and midget submarine crews pay a courtesy call on the CINC, Combined Fleet, Admiral Yamamoto aboard his flagship, the new battleship YAMATO. At 1100, the KO detachment departs for Penang, Occupied British Malaya. Departs Singapore for Penang. En route, she is mistakenly shelled by the IJA transport vessel URAJIO (VLADIVOSTOK) MARU, but receives no damage. Penang. The "KO" Detachment (less I-10 and I-30) load midget submarines aboard. I-10 is to reconnoiter selected points on the East African coast for possible attack. I-30 is assigned a similar reconnaissance mission and departs in advance. I-10, with Captain Ishizaki embarked, and the KO detachment depart Penang on her second war patrol and sortie westward in the Indian Ocean. The E14Y1 "Glen" from I-10 piloted by Lt(jg) Araki Shunshi (67) conducts a reconnaissance flight over Durban, but no targets of importance are sighted. Araki’s plane is detected from the ground and challenged, but the radioman, FPO2C Ito Yoshiharu, provides a spurious identification signal and escapes. At night, I-10's floatplane reconnoiters the harbor at Diego Suarez (now Antsiranana), Madagascar. The plane sights old ROYAL SOVEREIGN-class battleship (HMS RAMILLIES) at anchor in the bay. Also in the harbor are destroyers HMS DUNCAN and ACTIVE, corvettes HMS GENISTA and THYME, troopship HMS KARANJA, hospital ship ATLANTIS, tanker BRITISH LOYALTY, merchant LLANDAFF CASTLE and an ammunition ship. Captain Ishizaki orders a midget submarine attack be made the next night. 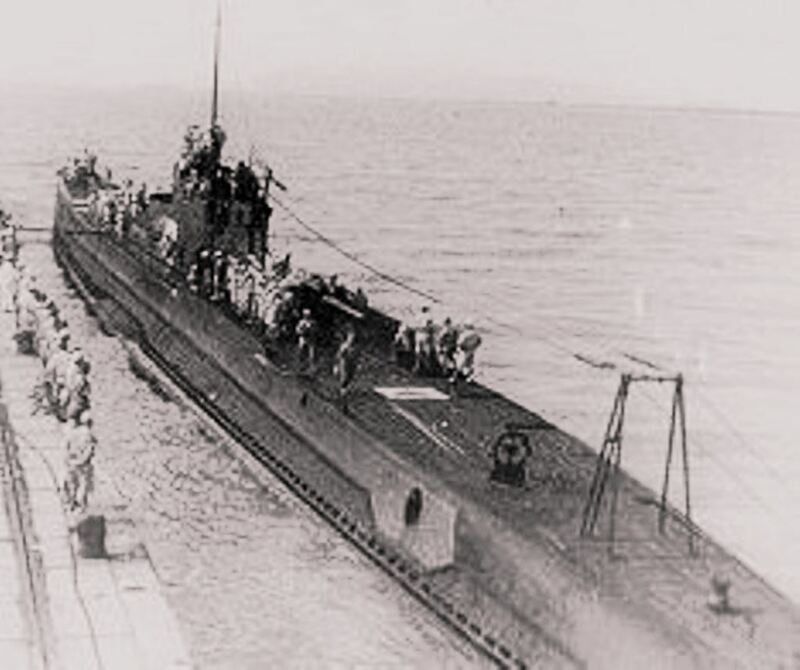 I-16 and I-20 launch their midget submarines about 10 miles from Diego Suarez to penetrate the harbor. At 2025, a midget, probably I-20's, torpedoes RAMILLIES. The torpedo blasts a 30-foot by 30-foot hole in her port bulge. British corvettes GENISTA and THYME drop depth charges. At 2120, I-20's midget under Lt Akieda Saburo with PO2C Takemoto Masami fires her second torpedo at RAMILLIES, but 6,993-ton tanker BRITISH LOYALTY, just getting underway, moves directly into the torpedo's path. The tanker is hit in the engine room aft and badly damaged and sinks in about 65 feet of water. (She is later refloated and sunk off Addu Atoll). Lt(jg) Araki conducts his second flight over Diego Suarez in an attempt to locate midget sub crewmembers, who might have escaped ashore. Mozambique Channel, 350 miles E of Beira. At 0231, I-10 sinks the 2,639-ton Panamanian-flagged steamer ATLANTIC GULF at 21-03S, 37-36E. At 1044, I-10 sinks the 4,999-ton American armed freighter MELVIN H. BAKER (ex-SEEKONK, ex-WILLMOTO) at 21-44S, 36-38W. Her crew is rescued by the British steamer TWICKENHAM. Mozambique Channel, 350 miles E of Beira. At 0953, I-10 torpedoes the 5,224-ton British steamer KING LUD, en route from New York to Bombay via Cape Town, carrying military personnel and government stores. KING LUD sinks at 20S, 40E; there are no survivors. Armed merchant cruisers AIKOKU and HOKOKU MARUs replenish and refuel I-10. Mozambique Channel, S of Beira. I-10 torpedoes the 4,957-ton British motor vessel QUEEN VICTORIA sailing from the Tyne to Aden with a cargo of military stores. QUEEN VICTORIA sinks at 21-15S, 40-30E; there are no survivors. At 1615, I-10 torpedoes and sinks the 4,504-ton Greek merchant NYMPHE at 15-48S, 40-42E. Cdr (Rear Admiral, posthumously) Yamada Takashi (49)(former CO of I-20) is appointed CO. Reassigned to the "C" patrol unit. Departs Truk to provide support for the midget submarine attack on Lunga anchorage. Departs Truk on her third war patrol to raid enemy communications south of the Solomons and reconnoiter Noumea, New Zealand and the Torres Strait. An E14Y1 "Glen" floatplane is embarked to conduct a recce flight over Noumea. I-10 passes the area E of Solomons, heading for the New Caledonia. 80 miles SSE of Noumea. I-10 chases a carrier escorted by two destroyers, but her approach fails and all torpedoes miss. S of Noumea. At 0015 LtCdr Yamada sights an unescorted transport. At 0020 two destroyers are sighted E of Noumea. Coral Sea, 115 miles S from Amédée lighthouse, New Caledonia. At 0449, I-10 torpedoes the 7,176-ton American "Liberty" ship SAMUEL GOMPERS en route from Noumea to Newcastle. GOMPERS receives one hit to the stern, explodes and sinks in 5 minutes at 24-28S, 166-20E. Around 1400 the I-10 attacks an unescorted transport, but her torpedo passes below the keel of the target. At 0542 the I-10 attacks another transport in the same area, but her approach fails and all torpedoes miss. After intercepting several radio messages from I-10, Allied radio intelligence concludes that she is about to navigate the Cook Strait that night. RNZAF air search fails to find any traces of the Japanese submarine in that area (in fact, I-10 had passed it more than a week ago). At 1050, I-10 attacks another transport, but misses. New Hebrides. I-10 torpedoes the 7,141-ton American tanker GULFWAVE at 20-30S, 174-45E, but GULFWAVE reaches Suva, Fiji, under own power and suffers no casualties. Cdr (later Captain) Tonozuka Kinzo (50)(former CO of I-34) is appointed CO.
Departs Sasebo to work up in the western part of the Inland Sea. Iyo Sea. I-10 and I-8 conduct refueling exercises. Departs Kure for Saeki Gulf with I-8 and submarine tender HIE MARU. Departs Saeki for Penang with I-8 and HIE MARU. Arrives at Penang where I-10 is appointed flagship of SubRon 8 until 2 September. At 1630, departs Penang with I-8 on her fourth war patrol with ComSubRon 8 Rear Admiral Ishizaki aboard. I-10 refuels and replenishes I-8 at 4-53S, 87-20E. I-10 refuels I-8 at at 22-25S, 76-15E. I-8 then detaches via the Cape of Good Hope for the German U-Boat base at Brest, France. Gulf of Aden. I-10 sinks the 7,634-ton Norwegian tanker ALCIDES enroute from the Abadan to Fremantle, Australia. Hit by two torpedoes, she sinks at 03S, 68E. I-10 comes alongside and takes ALCIDES' master, radio officer and second mate on board. The captured officers are imprisoned and freed by the Americans on 29 August 1945. Rear Admiral (later Vice Admiral) Ichioka Hisashi (former CO of YURA) assumes command of SubRon 8 from Rear Admiral Ishizaki. At 1600, I-10 departs Penang for the Indian Ocean with a five-man camera crew aboard on her fifth war patrol. The footage taken on this patrol is used for the propaganda film "Gochin!"(Sunk!). I-10 also carries an E14Y1 "Glen" floatplane to reconnoiter a suspected Allied air base on Perim Island. SW of the Chagos Islands, Indian Ocean. I-10 torpedoes and sinks 6,361-ton Norwegian tanker BRAMORA at 06-00N, 67-00E that was enroute from Bandar Abbas, Arabia with oil for Melbourne, Australia. At dawn, the "Glen" floatplane from I-10 piloted by Lt(jg) Yoshikawa Hajime conducts a flight over Perim Island, Strait of Mandeb. He reports that there are no airfields on the island. I-10 returns to the Gulf of Aden. Gulf of Aden, 75 miles SE of Aden. Around 0200, I-10 sights the 7,634-ton American "Liberty" ship ELIAS HOWE and starts a chase. At 0312, she fires two torpedoes at HOWE. One hits, killing two sailors in the engine room; a heavy fire breaks out and an SOS signal is transmitted. I-10 surfaces and fires another torpedo. 15 minutes after the second hit the explosives aboard the ship detonate and HOWE sinks by the stern at 11-40N, 44-35E. The survivors are rescued by British trawler HMS AIGLON (FY.1841) and a seaplane. Gulf of Aden. Around 1630, I-10 sights an Allied convoy heading west at 10 knots, and starts a chase. Cdr Tonozuka fires three torpedoes at the 4,836-ton Norwegian armed merchant STORVIKEN, en route from Mombasa for Aden with a cargo of coal. STORVIKEN takes two hits to starboard and sinks by the stern at 11-43N, 48-07E. Two crewmen are taken aboard I-10 as POWs. Gulf of Aden. Around 1610, the soundman on I-10 detects multiple propeller noises and soon thereafter a nine-strong convoy escorted by two destroyers is sighted (convoy AP-47 enroute from Aden to Abadan). I-10 commences a chase, surfacing after nightfall. 140 miles N of Cape Guardafui. At 0510, I-10 fires three torpedoes at overlapping targets at a range of 6,340 yds and then dives to 390 ft to escape depth-charging. Three explosions and breaking-up noises are heard. The 9,057-ton Norwegian armed tanker ANNA KNUDSEN, sailing with convoy AP-47, is hit by one torpedo to her starboard bow at 14-20N, 50-47E. As a result of serious flooding her master orders Abandon Ship. After the flooding is checked, the crew returns to the tanker. I-10 is briefly depth-charged and receives minor damage to the engine room. Cdr Tonozuka later claims three merchants as sunk. NW of Addu Atoll. At 1125, I-10 fires two torpedoes at the 4,533-ton British armed motor vessel CONGELLA (ex-MINDORO, ex-SAGAMI, ex-SECUNDUS) en route from Calcutta to Durban with 8,700 tons of general cargo. Both miss; Cdr Tonozuka orders Battle-Surface. The gunners of I-10 open fire until a fire breaks out aboard CONGELLA and she is abandoned. She sinks at 01-02N, 71-14E; her wireless operator is taken prisoner, 25 crew and three gunners are lost. 37 survivors are later rescued by HM whaler OKAPI and two RAF "Catalina" flying boats. I-10 is attached directly to the Sixth Fleet HQ. "Submarine I-10 will arrive tomorrow 10th by North Channel. Course 110 degrees." I-10 sustains minor damage during the air raid; three sailors are killed and two wounded. Following the attack, I-10 sorties from Truk in an attempt to intercept the carriers of TF 58 E of Natsushima (Dublon Island). E of Mili Atoll. I-10 is seriously damaged in a depth-charge attack and has to abort her patrol. Arrives at Yokosuka for repairs. Probably at that time an E27 Type 3 radar detector and a new Type 3 sonar are installed. Departs Yokosuka on her seventh war patrol to operate east of the Marshall Islands, carrying an E14Y1 "Glen" floatplane. Marshall Islands. After sundown I-10's floatplane reconnoiters the American fleet anchorage at Majuro. The pilot reports that the anchorage is empty. The landing floatplane capsizes and is lost; the crew is recovered. Admiral Owada orders most of the Sixth Fleet's submarines to withdraw from the Marianas area except I-10 and five others. The Combined Fleet orders Owada to evacuate Vice Admiral Takagi and his staff from their headquarters on the eastern coast of Saipan. Owada orders I-10 located E of Saipan to get Takagi and his people out. At 1200 (JST) I-10 transmits a situation report from the area 40 miles NE from Saipan, informing that he has not been able to break through the cordon of enemy ships. This is the last message received from her. Presumed lost off Saipan with all 103 hands. 110 miles ENE of Saipan. At 1702 the TG 50.17 with six tankers and USS BRETON (CVE-23) is refueling at sea, when the soundman on LtCdr Roland H. Cramer’s USS RIDDLE (DE-185) detects an underwater contact bearing 250 degrees, range 1,900 yards. The Task Group Commander orders his formation to execute an emergency turn to port. After firing a five depth-charge urgent barrage RIDDLE commences a new approach, but the submarine foils her attack, turning into the wakes of the retiring formation. Eighteen minutes later the contact is regained at 1,250 yards. Three patterns of "Hedgehog" projectiles are fired, but the submarine avoids being hit by diving deeper and maneuvering aggressively. At 1812, RIDDLE makes a depth-charge attack with a full pattern set deep without any results. The estimated range, bearing and target course are passed to USS DAVID W. TAYLOR (DD-551), who makes a contact at 1822 and drops 11 depth charges set to medium depth. At 1828, RIDDLE is about to commence another attack, when a heavy underwater explosion occurs directly ahead. No further contacts are obtained. By sundown, oil and debris break the surface at 15-26N, 147-48E. On the following day an oil slick is observed, stretching nine miles downwind from the point of attack. Several Japanese sources state that I-10 was launched on 20, rather than 29 September 1939. We have followed the authoritative "Showa Zosenshi" shipbuilding history in this case. One modern source dealing with the cryptoanalytic background of the Japanese attack on Pearl Harbor, suggests that I-10's floatplane was lost at Pago Pago four days later. This is not confirmed by wartime records. A popular account about the sinking of DONERAIL (not supported by wartime sources) suggests that she spotted the submarine first and nearly succeeded in ramming her. One popular account of the sinking of EXPRESS claims that immediately prior to the first torpedo hit she was illuminated by a starshell fired from the I-10. This must be incorrect, since I-10 attacked from the submerged position. HARTISMERE had survived an attack by the German U-boat U-100 in August 1940. While several survivors from ALCHIBA claimed that their ship was attacked by no less than two submarines, in reality only I-10 was involved. At that time the Pacific Theater C-in-C, Fleet Admiral Chester W. Nimitz and Secretary of the Navy Frank Knox participated in the COMSOPAC conference held on Noumea. Lt(jg) Sasakura evidently failed to detect any signs of that event. Cdr Nakajima's first name appears in several sources as Seiji. The prewar Japanese navy lists (1936, 1937, inter alia) identify him as Nakajima Kiyoji.